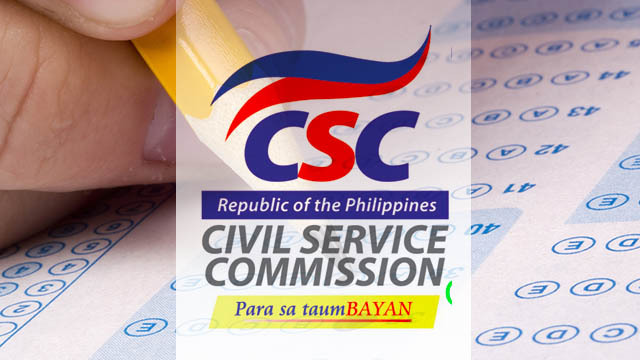 MANILA, July 28 -- A total of 242,901 Filipinos will take the Career Service Examination - Pen and Paper Test (CSE-PPT) on Aug. 6, the Civil Service Commission (CSC) announced Friday. Of the figure, 208,757 examinees (85.9 percent) will take the Professional level exam, and 34,144 examinees (14.1 percent) the Sub-professional level exam. In a news release, the commission advised examinees to check their school assignment online at the Online Notice of School Assignment (ONSA) at the CSC website, or call the CSC regional or field office where they filed their application. It also advised examinees to visit the assigned school/testing venue before the exam day to be familiar with its location. On exam day, examinees should arrive as early as 6 a.m. to verify their room assignment. Gates of testing venues will be closed to examinees at exactly 7:30 a.m. and latecomers will not be admitted. Only black ball pens will be allowed in filling up the answer sheet. Gel pens, sign pens, fountain pens, friction pens, or any other kind of pen, including other ink colors, will not be allowed. Examinees must bring a valid ID card, preferably the same ID card presented during the filing of application. If the examinee presents a different ID card, he/she must present any of the following, provided it is not expired: Driver’s License; Passport; PRC License; SSS ID; GSIS ID (UMID); Voter’s ID; BIR ID (ATM type/TIN card type with picture); PhilHealth ID (containing the applicant’s name, clear picture, signature and PhilHealth number); Company/Office ID; School ID (validated for the current school year/semester/trimester); Police Clearance/Police Clearance Certificate; Postal ID; Barangay ID; or NBI Clearance. If the ID card has no date of birth, the examinee must bring an original copy of his/her Birth Certificate printed on security paper issued by the Philippine Statistics Authority or the Local Civil Registry. The no ID, no exam rule will be strictly implemented. Examinees may also bring their application receipt with CSC Official Receipt, if available. Examinees are required to wear proper attire on exam day. Sleeveless shirts/blouses, short pants, and slippers will not be allowed. If female examinees are wearing a hijab, they will be asked to remove the head covering or at least enable the CSC staff to see their facial features, to verify their identity.